We're happy to announce our next release! many more delicacies. Most of them released on vinyl or MC only. All remastered with greatest care! 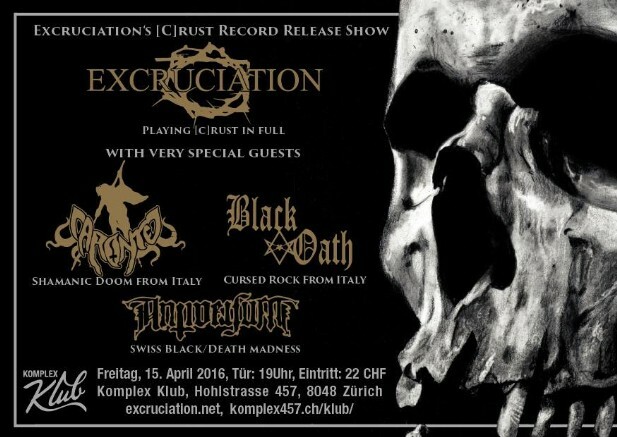 A release show will happen on March 23 at Ebrietas Zurich, Switzerland! and it didn't turn out very well for him. 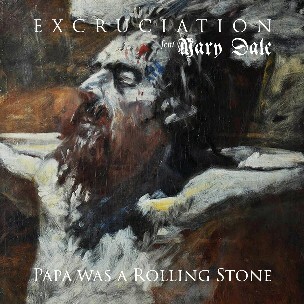 Papa Was A Rolling Stone feat. the charismatic Mary Dale. Released on all digital plattforms! Stig .C. 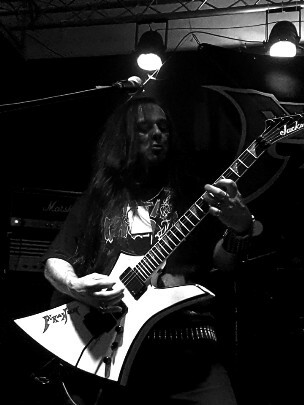 Miller from Amebix. Featuring the last song we recorded with HNS! 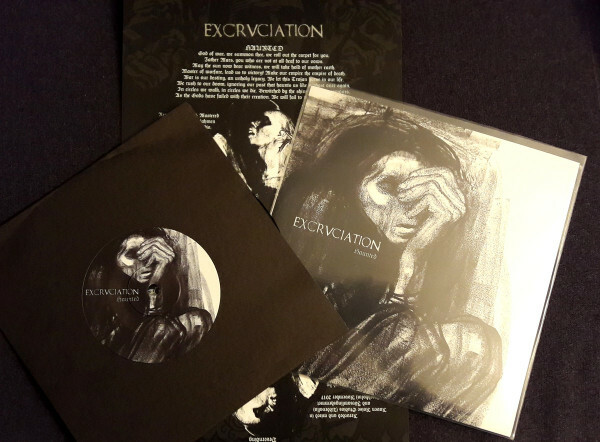 Released by Auric Reords as Picture and reguöar black vinyl 7". welcome back George as a full member! Really excrited about this one! 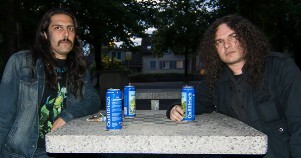 A split with the mighty Heavydeath! Featuring unreleased songs by both bands! 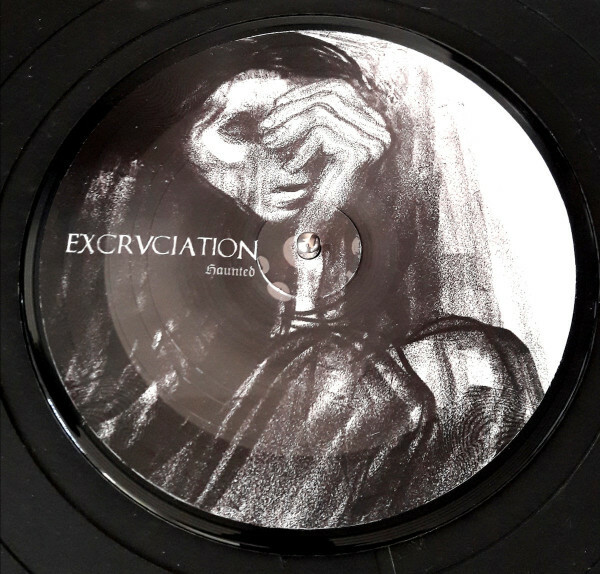 Released as Picture 7" and regular 7". We're excited to announce this new release. the German newcomer Babylon Asleep. Released as a limited edition 7" picture disc with inlayand MC. Both version come with a free digital download. will lend us a helping hand. 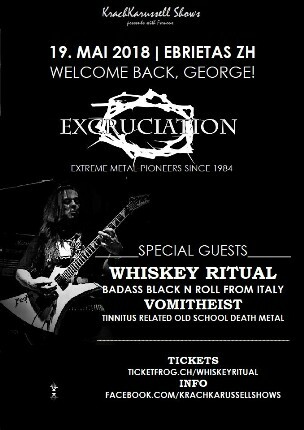 George was already active with Excruciation from 1989 - 1991 & 2005 - 2007 and now it's time for a third round. He's got the skills, he's got the spirit! He is looking for new territories that we are not able to fulfill. We wish him all the best for his musical and professional career. Thank you for the music, friendship and the good time we had together! 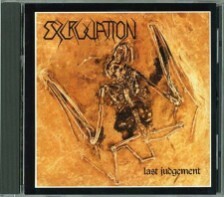 We are happy to announce the release of the "Last Judgement" on CD by The Crypt / Dark Symphonies! 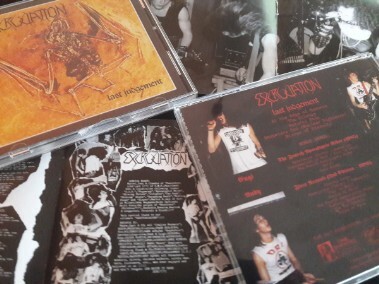 For the first time on CD including "The First Assault" and "The fourth apocalyptic Rider" demos. Remastered from the best possible source available. 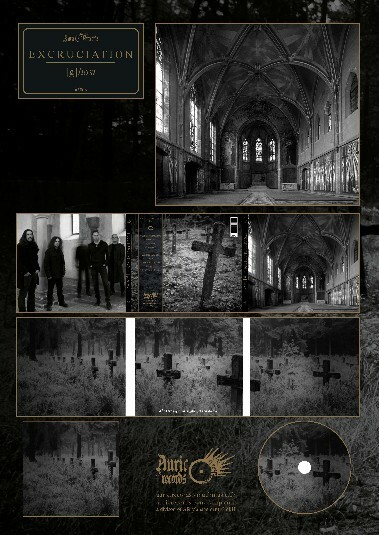 We proudly announce our continued cooperation with The Crypt / Dark Symphonies! "Prophecy of Immortality" (1988) on CD & LP. Thanks to Ted Tringo from The Crypt for bringing our history alive! We hail Shayna Baszler, a great fighter with a great taste in music! WormHoleDeath - Dreamcell 11 & Auric Records. The wait is almost over...Another taste of [c]rust. "Lutheran Pslams" and the unreleased "Lybia 1942"
at Komplex Klub in Zurich. Featuring some fantastic guests like Caronte, Black Oath and Antiversum. Recorded during the [c]rust session in Italy. To be released December 24, 2016. 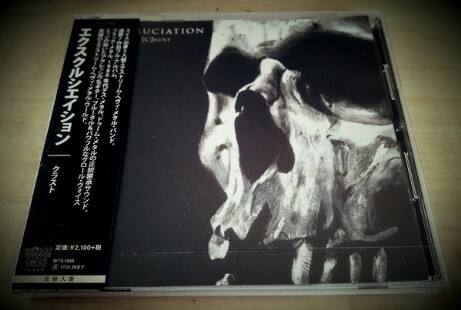 Limited edtidion MC by Auric Records. Limited edition Floppy Disk by Floppy Noise Records. Currently recording our next album [c]rust at RealSound Studios, Langhirano, Italy. To be released early 2016. Check out our Facebook site for additional news! for the release of [c]rust that will be produced by Wahoomi Corvi and will be unleashed during 2016. 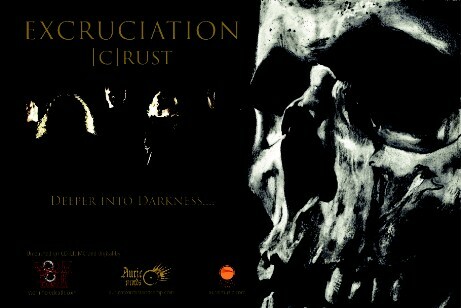 [c]rust will represent the band's deeper step into darkness and will be released in collaboration with the bands own label Auric Records. 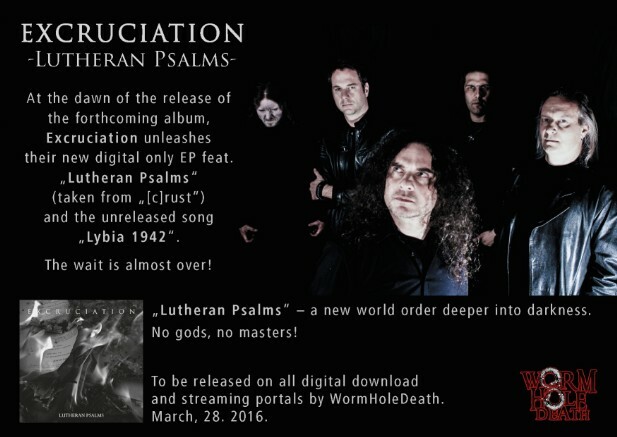 80s Dark Wave and Crustcore to oldschool Black and Doom Metal into a new piece of extreme metal! Behold! "We are honored to work with such a cult band and we will do everything possible to support their work at the best possible level. 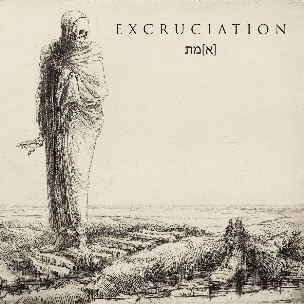 We have asked them to go deeper than they did with [G]HOST as we are willing to expose the essence of EXCRUCIATION, the skeleton of this band. 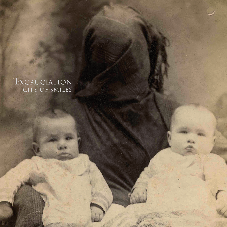 We will expose the violence and straight downward energy that lies within EXCRUCIATION. They told us, human flesh and skin is the crust that keeps us standing. 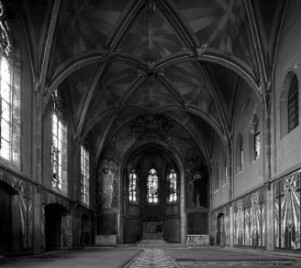 But like rust eats iron, life decomposes the shell and nothing more than dust and bones will remain." 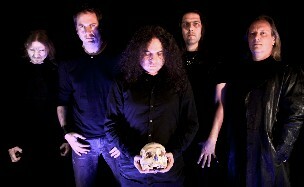 The Crypt/Dark Symphonies secured the rights for the first official CD release of Last Judgement! 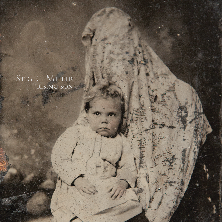 To be released summer 2015. 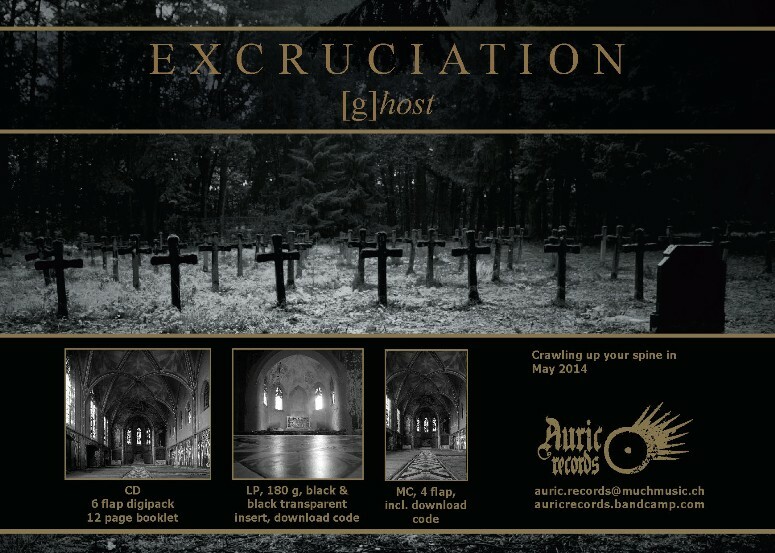 "EXCRUCIATION (Swi) The Last Judgement + Demos Official CD Coming Soon DARK SYMPHONIES / THE CRYPT! 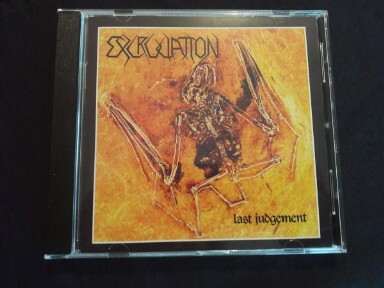 We are proud to announce our cooperation with legendary Swiss thrash metal act EXCRUCIATION, to present for the first time ever on CD, their classic debut album "The Last Judgement". Originally released in 1987 only on vinyl, we are proud to offer this classic release on compact disc format! 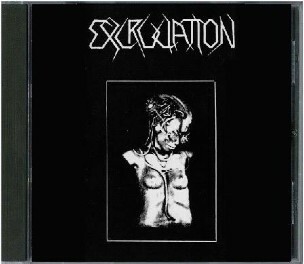 Also making their CD debut, as a bonus we will also be including the bands' 1985 "The Fourth Apocalyptic Rider" and "First Assault" demos. This amazing piece of history will have the same standard of quality as the original CRYPT LP version and features original cover art, classic band photos, reviews, interviews, new liner notes and lyrics. This CD is designed after the original 1987 CHAINSAW MURDER Records LP release, taking elements from the original layout with attention to detail, even down to the logo and typeface for a touch of nostalgia. 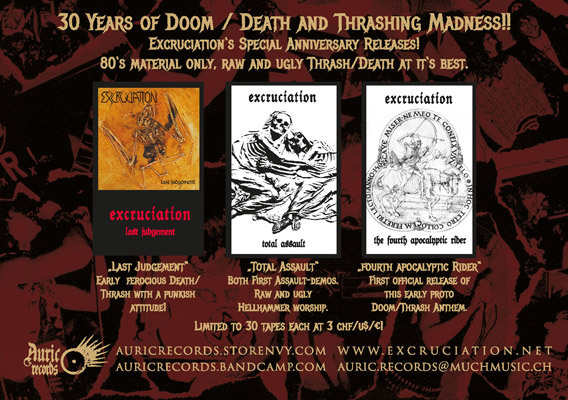 Excruciation will be 30 this October! 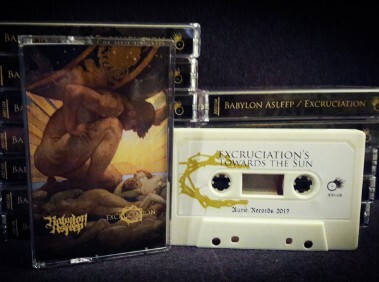 For this occasion Auric Records has released a special limited editon of tapes. Including the first demos and the Last Judgment mini-LP. 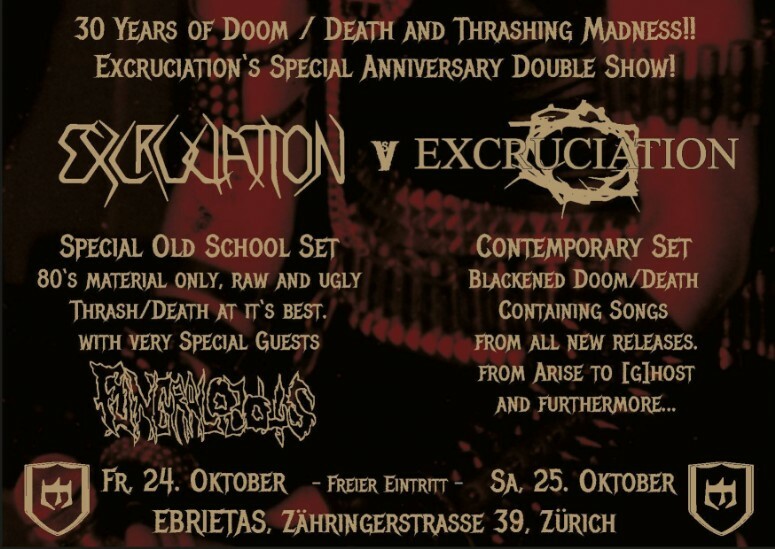 A special show will be held at Ebrietas, Zurich. and on saturday an extended show including songs from all new releases! Doom-metal.com named [g]host Album of the month August! "this album doesn’t just look good, it sounds great too." "[g]host” is an album that is a definite must for the majority of the metal community." "sophisticated, technically and qualitatively compelling Album"
and one for Art-Noir 'zine with Eugenio and Hannes (in german). We are honoured and thank you! 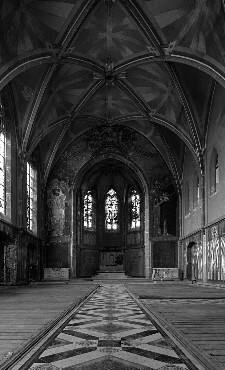 "The tone is majestic, sad, atmospheric, dark, almost Stoner, Zurich veterans know how to make use of their musical experience for the demanding audience." 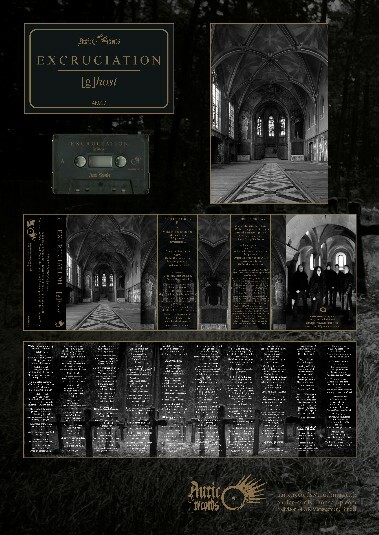 As a bonus you'll get the two covers released on the "Worship" 7"! All preorders get 3 instant tracks and we will send you the CD for free if you show us your receipt! Scan or make a photo of it and of course, you can show it to us in person. 9 tracks of grief, agony, hate & unmasked truth! - MC, pro made/pro printed 4flap inlay/download code. Illustrated with stunning pictures by Jascha Hoste & eerie band photos by eisa.ch. Mastered by Mell Dettmer, Studio Soli, Seattle, WA. 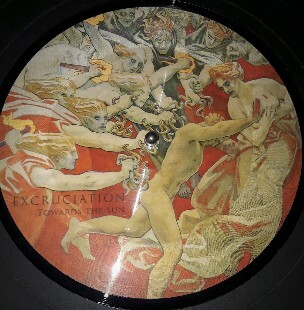 Released through Auric Records. May 2014. 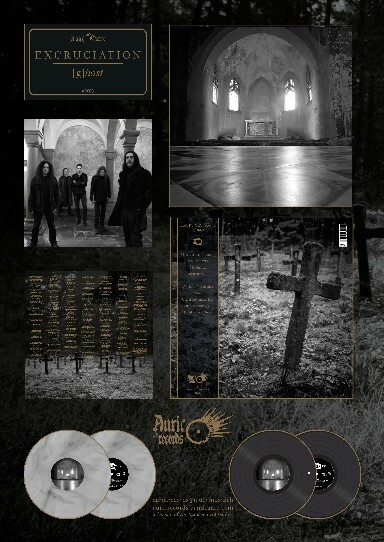 In Switzerland it will be released through Gadget Records and distributed by Phonag.